At least 41 people have died in the province of Buenos Aires after heavy rains caused flash floods in Argentina. One of the heaviest storms recorded moved through the province hitting capital Buenos Aires and the city of La Plata. In La Plata, between 300 mm (12 in) and 400 mm of rain fell in a few hours. At least 35 people were killed in La Plata, said provincial governor Daniel Scioli, adding that the city “has never seen anything equal” to it. Daniel Scioli said city authorities had been discovering the bodies as the flood waters slowly receded. At least another six people had died in the city of Buenos Aires on Tuesday. About 280,000 people remain without power in Buenos Aires province, according to figures given by National Planning Minister Julio de Vido. “Our job is focused on restoring service, but we’re going to wait until the equipment dries to guarantee the safety of the electricity workers, because we don’t want any deaths,” said Julio de Vido. Daniel Scioli said that many of those who died in La Plata were drowned or electrocuted after taking shelter in their cars in the suburb of Tolosa. “We are giving priority to rescuing people who have been stuck in trees or on the roofs of their homes,” he added. Some 2,500 people have been evacuated from their homes. La Plata’s oil refinery was flooded and then had to close due to a fire. YPF, the company which runs the facility, said “an extraordinary accumulation of rainwater and power outages in the entire refinery complex” caused the fire. In Buenos Aires, one of those who died was a worker for the city’s underground system who was electrocuted while trying to pump water from a flooded station. Buenos Aires Mayor Mauricio Macri said about 350,000 people had been affected by the torrents of rain. 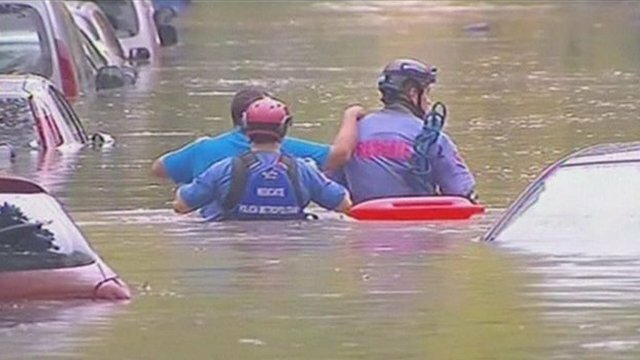 Thousands of cars were carried away by floods and hundreds of families had to be evacuated from their homes. Buenos Aires authorities said it was the heaviest April rainfall in a century.